"Acche Vajpayee ka kya karoge (what will you do with a good Vajpayee)?" 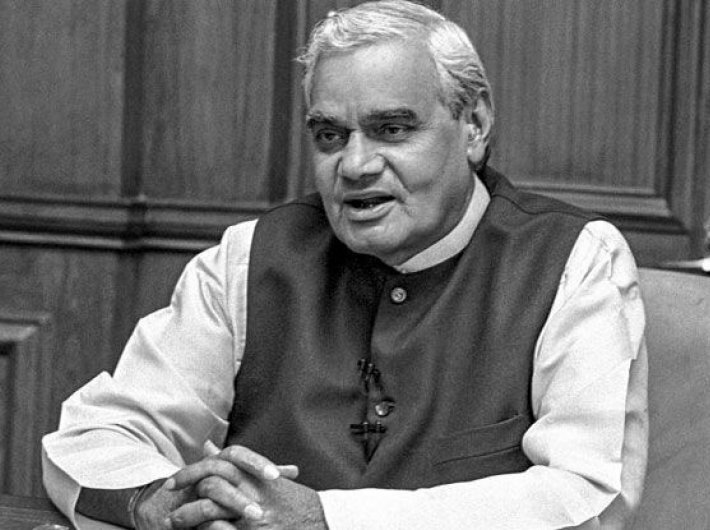 Atal Bihari Vajpayee once responded to the Opposition's barb that he was "a good man in the wrong party" in his inimitable style during the trust motion in 1996. The style of delivery was such that the house plunged into a peal of laughter. The Vajpayee government lasted only 13 days but the Lok Sabha witnessed his oratory at best. It was not without reason that his expositions in Parliament endeared him to first prime minister Jawaharlal Nehru. There is an apocryphal story about Nehru predicting that Vajpayee would be the "future prime minister". Without doubt, Vajpayee in the 1950s and 1960s had emerged as a public speaker par excellence in his own right. But he was one who never lost touch with reality. He realised very early that the crowds enthralled by his speeches would not be turned into voters for his party, the then Bharatiya Jana Sangh (BJS). "Sunne sab aate ho, par vote nahi dete ho (you come here to listen to me, but you don't vote for us)," he said at one of his rallies in Kanpur in the 1970s. There is an interesting anecdote narrated to me by his old friend Yadav Rao Deshmukh. In the early 1970s, Vajpayee contested from two Lok Sabha seats in Uttar Pradesh and lost both. After losing the election, he asked Deshmukh to go watch a film with him. Both of them rode a cycle and watched a film. In fact, there is no doubt that Vajpayee symbolised Indian genius. On the face of it, he looked quite ordinary and vulnerable, yet, he was endowed with a charm unparalleled since Nehru. In a party in which a section of orthodoxy is stuck in a time-warp, Vajpayee stood for everything that is nothing short of heresy. He was fond of good food, including non-vegetarian. His lifestyle was spartan, but not ascetic. He lived with an adopted family, even though he was a bachelor. One of the things that will always stand out were his innovative puns that could disarm even his worst foes. In one of the national executive meets at Goa, he wore jeans and a T-shirt, and looked at the weather, saying, "It is very madak (sensuous) weather." A colleague of mine standing close by quipped, "How do you know this, Sir, since you are a bachelor?" Vajpayee looked at him mischievously and said, "Arre bhai shaadi nahi ki to kya baraat to gaye hain (I am not married, but I've attended many weddings)." Needless to say that his remark evoked a hearty laughter in the audience. But behind the façade of light banter and his amiable disposition lay a serious politician who was committed to the upliftment of the poor and a tough taskmaster who brooked no nonsense when it came to governance. Remember the manner in which he stoutly defended his turf in 1998 when he did not concede to J Jayalalithaa's demand of inducting Subramanian Swamy in the Cabinet. Similarly remember the manner in which he dropped Ram Jethmalani from the Cabinet over his falling out with the then Chief Justice of India. Similarly, when Pramod Mahajan proved to be too big for his boots, Vajpayee very swiftly transferred him. That his one-liner was often quite forceful became evident when he was confronted with a situation of Jena Krishnamurthy not relinquishing the post of BJP president during his second stint as the prime minister. He only said, "Who am I to ask him to quit? He can remove me as the prime minister." Of course, the message was enough to send Jena packing. Although a Brahmin by caste, Vajpayee in his heart was consistent in his politics that was favourably disposed towards backward classes, Dalits and marginalised sections of society. There were several instances at the height of anti-reservation movement in Gujarat in the 1980s when Vajpayee visited the state and distanced the party from the stir. In one of his meetings, he is believed to have said, "Even if God tells me to do it, I will never remove reservation." That showed his commitment to the uplift of marginalised sections of society. And he insulated the BJP from the anti-reservation stir. However, his soft exterior was quite deceptive when it came to taking a tough decision. Pakistan must have realised it after the Kargil intrusion. Although maintaining a balanced approach without falling for warmongering hysteria, he flushed out intruders in a manner that won international acclaim. He maintained extraordinary restraint while sending out the toughest message to Pakistan. His closest friend and then home minister LK Advani described Vajpayee as a leader who had "the exterior of a lotus, but was as strong as Vajra (Lord Indra's weapon) from within." However, the fragility of human life caught up with Vajpayee after the 2004 election. By 2009, he was not in a position to continue with his political life, even though he occasionally kept on guiding his colleagues as long as his physical conditions allowed him. In the truest sense, there was something mystically transcendental in Vajpayee's political persona that made him an unparalleled leader in Independent India.